Ira Gale started the company in the early 1970’s: The GS401A (Chrome Ended), GS401B (Standard Flat Front), and GS401C (Curved Front) all three shared the same components. 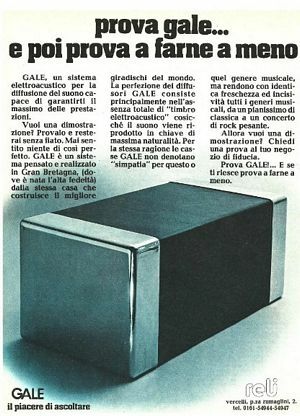 They were notorious for being power hungry and being able to handle very high sound levels in excess of 100watts which for the early seventies was indeed unusual. GS401 speaker is an infinite baffle cabinet with crossovers at 475 Hz and 5,000 Hz it was typically constructed from three layer high density 18 mm thick chip-board, incorporating internal bracing to eliminate panel resonances and the use of gaskets to keep an air tight enclosure. Each GS401 had two doped Acoustic Research derived 210mm bass drivers sourced from CTS (Chicago Telephone Supply), a Peerless K040-MRF four inch midrange, and a Celestion HF2000 tweeter. Each of these components is now long out of production and the Celestion tweeter now demands high prices in the used market place. The Peerless midrange is commonly regarded as one of the best and was used by many other well regarded loudspeaker producers of the era such as Rogers, IMF and Nightingale amongst many others. The GS401C used American Walnut veneer finish and sculpted brown fabric grilles and sound identical to their chrome ended partner. Overall dimensions are slightly smaller than the GS401A and the weight considerably less due to the lack of metal end caps. They are more suited to vertical use and the Chrome GS401A is more often used in the horizontal position. Matching tube framed stands (GSS101) in either black or chrome were available. Most GS401C's were made in the UK but later a version was briefly built in the US. The assembly quality of the US version was inferior as it used point to point soldered crossovers with no PCB and an uncertain mixture of components from the US and Mexico which were siliconed to a simple hardboard back. On introduction of the GS402 Early pairs retained the GS401's woofers and midrange, and substituted a Philips AD tweeter in place of the Celestion model (although derivatives or mixtures of these drivers are found) later models have OEM Peerless derived bass drivers. It had a simplified crossover using ceramic resistors and exhausted crossover heat via a rear vent. Available in finishes of Black Ash, American Walnut, and Rosewood and even Chrome end caps (this version is rare to find). It was also capable of a higher 200 watt power handling and presented a more stable amplifier load. 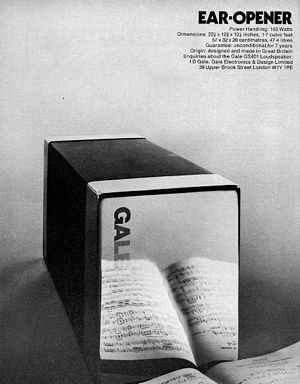 A full and comprehensive history can be found at our related forum:www.galeaudio.com (with thanks to John Mayberry in California).